This interesting surname is of English locational origin from either Bredon in Worcestershire, recorded as "Breodun" in the Domesday Book of 1086, or from Breedon in Leicestershire, recorded as "Bredona" in the Danelaw Charters. The placename is composed of the British term "bre" meaning hill plus the tautologous Old English pre 7th Century addition "dun" hill. "British" (as above) refers to the extinct Celtic language of the ancient Britons. Locational names were originally given as a means of identification to those who left their village or place of origin to settle elsewhere and the surname is mainly found in Scotland and Northern England. Phelippe de Briden of Roxburghshire rendered homage in 1296. 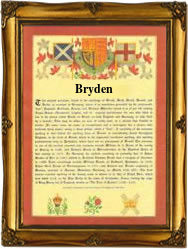 William Brydonne, is noted in Edinburgh, Scotland, in 1371. Johannes de Bredun appears in the Poll Tax Return of Yorkshire (1379). In the modern idiom the surname has many variant spellings including Bryden, Brydone, Bre(e)don, Breeden, Briddon, etc.. On October 10th 1594, Luce Brydon and Edmund Murton were married at St. Mary Magdalene, Old Fish Street, London. The first recorded spelling of the family name is shown to be that of Ralph de Bredon, which was dated 1272, in the "Testa de Neville", Leicestershire, during the reign of King Henry 111, known as the "Frenchman", 1216 - 1272. Surnames became necessary when governments introduced personal taxation. In England this was known as Poll Tax. Throughout the centuries, surnames in every country have continued to "develop" often leading to astonishing variants of the original spelling.